Saturday night at Staples Center was a lot of things to many different people. It was Mattias Norstrom tribute night. It was Ilya Kovalchuk’s only appearance on LA ice this season. It was a night of nostalgia, seeing several former players that were here during the Andy Murray years – guys like Glen Murray, Mathieu Schneider and Ian Laperriere. 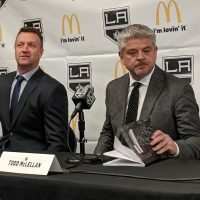 It was Rob Blake’s first return to the arena as a retired player. It was Jonathan Quick putting on another spectacular performance. And it was another win for the Los Angeles Kings. The thing is though, it wasn’t simply just another win. 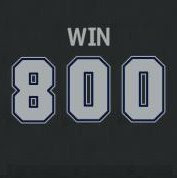 It was the 800th regular season home victory in franchise history. Prior to moving downtown they had picked up 572 wins at the Forum in Inglewood, eight wins at the LA Sports Arena and two wins at the Long Beach Arena. 0 – Kevin Westgarth is still sitting at zero fights for the year. 1.84 – Quick lowered his goals-against-average again…it now sits at 1.84, with a record of 7-1 in his eight starts. He should have been one of the three stars of the game. Come on, the guy saves a season-high 39 and doesn’t even get a mention? 4 – Having the former players skate onto the ice for the pre-game ceremony was a nice touch, something unique. 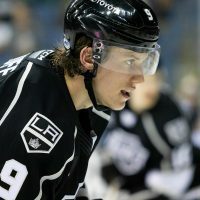 However, did you ever think you would see Blake skate onto the ice in a Kings jersey again? 8 – Double-sided coin here…Drew Doughty missed another game and the Kings secured their eighth win of the month. 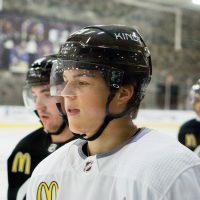 9 – Forward Zach Parise, rumored to possibly be available via trade, left the ice after the second period with the famous ‘lower body injury’ and never returned. Things were bad enough that he flew back to New Jersey for an MRI. Results are pending. 14 – It’s only fitting that on a night designated to celebrate the achievements of Norstrom that the man now donning his #14, Justin Williams, picked up the first goal of the game. 16 – With the win LA finished the first month of the season with 16 points (8-3-0), tops in the NHL. Their perfect 4-0 record at Staples Center also leaves them as the only team in the league still unbeaten at home. 17 – The Devil came to town. 20 – NJ Devils had 20 shots on goal in the third period…TWENTY! 22 – The tear-jerker moment of the night may not have been the ceremony for Norstrom. It was probably seeing Laperriere skate onto the ice wearing a Kings jersey. He should have never been allowed to leave. Should have retired a King. 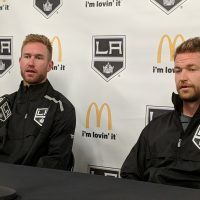 23:05 – Defenseman Willie Mitchell followed up his strong game in Dallas on Thursday (where he scored his first goal of the season…and the first by a Kings d-man) with another solid performance. He had just over 23 minutes of ice-time (tops on the team) and earned the second star of the night. 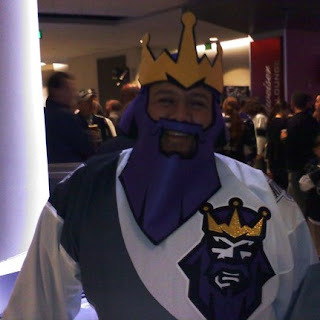 28 – Possible MVP so far for the Kings, Jarret Stoll had another goal. 100,000,000 – It just doesn’t buy you what it used to. Didn’t catch your name, but kudos to you guy.